Kitchen Window: Comte Shows There's More Than Gruyere In The Alps With flavors of fresh butter, citrus, hazelnuts, caramelized onions or chocolate, Comte is a cheese with more range than Meryl Streep and a texture just as seamless. 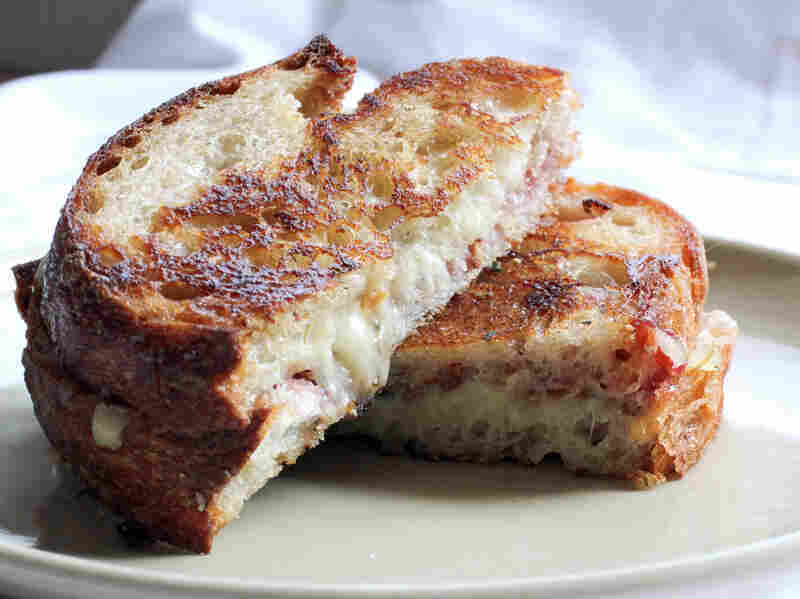 Get recipes for Tri-Color Comte, Cherry And Hazelnut Salad, Celery Root And Potato Comte Gratin And Strawberry Jam And Walnut Herbed Grilled Comte Sandwich. Known for its fondue-ready texture and nutty taste, Swiss Gruyere has long been the cheese of choice for cooks who want something as smooth melting as mozzarella but with more complexity. But in the mountains just across the French border, there's another Alpine-style cheese that just might one-up this standard. With flavors of fresh butter, citrus, hazelnuts, caramelized onions or chocolate, Comte is a cheese with more range than Meryl Streep and a texture just as seamless. It is a smooth, firm, butter-colored cheese that darkens at the rind. Most Comte found in the United States is 8 to 12 months old, but occasionally, an up to 2-year-old, more powerful Comte can be found at select cheesemongers. Some say Comte's flavor resembles Gruyere's. It does a little, which is no surprise given its history. The author of the book "It's Not You, It's Brie: A Guide to Unwrapping American Cheese Culture," Kirstin Jackson is a writer, educator, professional cook and consultant, who focuses almost entirely on cheese, wine and beer. When not traveling the world in search of the perfect wheel or teaching classes around the country, her fromage musings can be found on her blog It's Not You, It's Brie, on Twitter and her newsletter. Gruyere formerly was used as a catchall term to describe Rhone-Alpine-style cheese in the western French and eastern Swiss mountains until 2001. Family members included Comte, Beaufort, Abondance, French Gruyere and Swiss Gruyere. Made in the somewhat similar fashion typical of these mountains, the wheels are large (at least 15, and up to 90 pounds), cooked and pressed cow's raw milk cheeses. In 2001, however, Switzerland received AOC (Appellation d'Origine Controlee/Controlled Appellation of Origin) status for its Gruyere. This meant unless a cheese was made via specified methods in AOC Swiss provinces, it could no longer go by the name (except for some made in a tiny French region that never makes it across the pond). With very effective Swiss marketing, Gruyere quickly earned more kitchen space than its former cheese relatives. Comte-Gruyere, an AOC cheese since 1958, became Comte. Lesser known, but with just as storied of a history and its own marketing team making strides, Comte has been garnering attention here too. A cheese first made more than 1,000 years ago to tide families over during the harsh Jura winters when milk was less abundant and cows were cooped up in barns, Comte is an 80-pound cooperative cheese. Because dairy farmers had small herds and making cheese is so much work, communities pooled their milk and hired fromagers (cheesemakers). Comte is still made this way today, and most fromagers still live over the room where they turn milk into wheels for the tightknit communities. After the cows are milked in the morning, farmers bring their milk to the fromager. The fromager gently heats the milk in a copper vat, adds rennet and cultures they made that morning, waits for the curd to reach the consistency of a firm custard, then cuts it into rice-sized pieces and cooks them on low heat. Next the curds are separated from whey and pressed in wheel molds. After about 7 hours, the still-elastic and white Comtes are taken to a cellar and rubbed down with salt and a brine to form the rinds. Three or so weeks later, the cheese babes are taken to an affineur (a professional who ages and nurtures cheese) to ripen. All of this is dictated by AOC rules. Like all AOC cheeses, Comte is highly regulated. It must be made in the Franche-Comte Jura mountains according to rules dictating all levels of its production. Such rules state: how much pasture a cow (Montbeliard only, please) requires — 1 hectare; the type of board cheese must be aged on — Jura spruce; the way udders must be cleaned and how beneficial microflora should be encouraged; and, the maximum number of wheels a cheesemaker can make per day, or month. The rules concerning the cheese's production are safeguarded and determined by boards of Comte dairy farmers, cheesemakers, affineurs and cheesemongers. They exist to protect the cheese's quality, tradition and livelihood of those connected to it, yet are open to reconsideration if research suggests a way to improve Comte without varying its characteristic deliciousness. Flavor variations due to terroir and microflora in different regions of the Jura are encouraged, too, as long as they stay true to form. After its 4 or 6 months in affinage caves, Comte takes on its characteristic flavors and texture. Sweet, lactic flavors are its base, but depending on which farms the milk is from, how long, or where it's aged, it will taste as varied as cafe au lait, mushrooms, brown butter, chocolate or pineapple. Because Comte is so giving and its flavors so many, it has super kitchen potential. It's good melted, grated, shaved, baked or on a cheese plate. If buying from a supermarket, look for one that was wrapped recently. If procuring from a cheese shop, taste. Cross your fingers that they have more than one type of Comte for you and your taste bud's perusal. 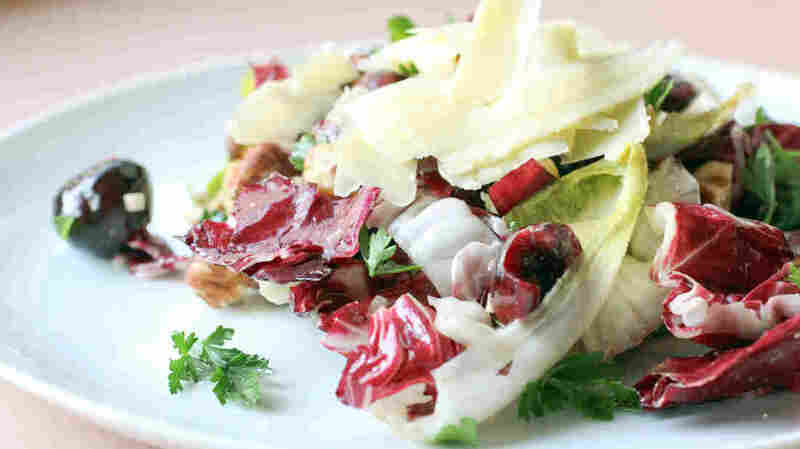 With an already visually appealing blend of radicchio, Belgian endive and parsley, this salad offers even more color with dark cherries and off-white or yellow Comte. The lightly bitter greens complement the sweet, rich flavors of the cheese and hazelnuts, and the shallots, lemon juice and parsley keep the dish lively. If fresh cherries are not in season, peaches, persimmons, apples or dried cherries will also work. Taste and buy your Comte from a high-end cheese shop if possible for this dish. Its complex flavors have a great chance to shine in this salad. Wash the endive and radicchio. Cut off the bottom of the endive and peel away the leaves, slicing more from the bottom as you get closer to the center to loosen the leaves. Cut off the bottom of the radicchio. Set the base on the cutting board and slice in half from top to bottom. Slice once more in the opposite direction. Being careful not to loose too much of the leaves, remove the core and cut each of the radicchio quarters into three pieces. Add this and the parsley to a large bowl. Put the mustard, shallot, lemon juice, olive oil and salt in a small bowl and whisk or stir with a fork until the mixture emulsifies. Add the hazelnuts, cherries, dressing and half the Comte to the large bowl. Mix with your hands. Salt and pepper to taste. Divide onto plates and top with the remaining Comte shavings. Comte adds a sweet touch to this rich dish, and the addition of celery root provides a little diversion from the classic potato gratin. When choosing celery root, look for a young one to avoid tough fiber in the dish, and don't be afraid to peel away to the softer inner core if the layer under the peel feels dry or rough. 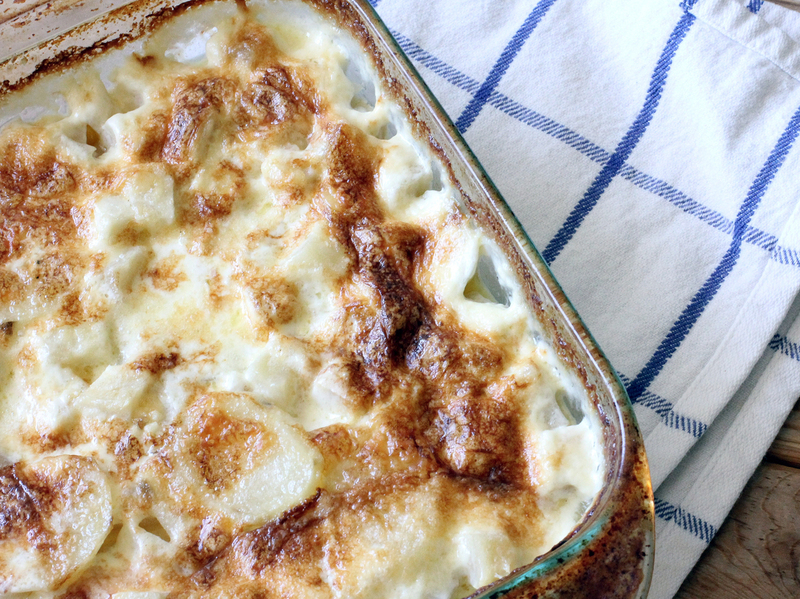 Keep the sides with this one light — it's rich and heavy, just as a gratin should be. Bring a small pot filled with enough water to cover the celery root to a boil. Add the sage, enough salt so the water tastes like the sea and the celery root. Reduce heat to a simmer and cook for 12 to 20 minutes - until the celery root pieces have lost their fibrous bite. Drain. Butter an 8-by-8-inch baking dish. Preheat the oven to 325 degrees. Put the cream, garlic, salt and nutmeg in a medium-sized saucepan and bring to a boil. Stir, remove the pot from heat and keep warm. Slice the potatoes 1/8-inch thick, put in a bowl and cover with water to keep from browning. Working in layers, put 1/4 of the cooked, warmed cream mixture on the bottom of the buttered pan, stirring it as you layer to make sure the garlic is evenly distributed through the dish. Evenly layer both a third of the potatoes and celery root over the cream. Top with cheese. Repeat until finished with the root vegetables and cheese, then top off the dish with the remaining cooked cream. Cover with foil and cook for 45 minutes. Remove the foil and cook for 30 or 45 minutes longer, until the top is brown and the potatoes are cooked through. Let sit for 10 minutes before serving. I've always liked the idea of a slightly sweet grilled-cheese sandwich. This one is kept savory with a light salting of the bread and rosemary, and the optional red pepper flakes offer a little kick. Place the chopped rosemary and thyme together in a small bowl and stir until combined. Pair the bread for sandwiches. Lightly butter one side of each of the 8 pieces of bread. Next, butter the other side of 4 of those same pieces. Lightly salt the bread that has both sides buttered. Divide and spread the strawberry jam among the unbuttered portions of the original 8 slices. Sprinkle with a quarter of the mixed herbs and the walnuts. Top with grated Comte and a quarter of the red pepper flakes. Use the remaining buttered slices to cover the sandwich base. Heat 1 teaspoon of butter per sandwich in a heavy bottomed cast iron skillet or pan over medium heat. Place the sandwiches in the pan and press down firmly with a spatula. Sprinkle with an additional pinch of salt to taste and reduce heat to low. Flip when the first side is golden brown, about 5 to 7 minutes. Repeat with the second side on medium-low heat. The sandwiches are ready when golden brown and the cheese is melted. Serve immediately.